This remarkable book, "Fresh Air Poultry Houses," by Prince T. Woods, M.D., has made a comeback since its original printing in 1924. Yes, 1924. Readers can enjoy the humorous and archaic writing style while gleaning relevant information. "Dank, dark and smelly" is a lethal combination, according to the book's introduction. "If fresh air and sunshine, instead of being free to all, were delivered by meter and charged for at high rates, both would be in greater demand and much more appreciated," writes Prince. "It is pretty well-known that when so-called un-civilized naked savages, who live in the open, are taught to wear clothes, live in closed houses and adopt other habits of civilized white men, they soon sicken and die of 'white man's diseases,' often of tuberculosis," writes Prince. The wise doctor practices what he preaches. "Here in the variable climate of Eastern Massachusetts, often bleak, blustery and very cold in winter, my own family have used an open-air sleeping porch, with wire screen front, on the south side of our house, both summer and winter for the last ten years. 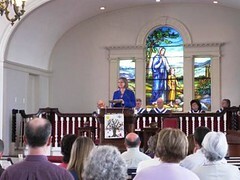 The results have been entirely satisfactory and some of our neighbors have followed our example." BRRR! Sleeping outside in the winter in Massachusetts? He's a bit crazy. 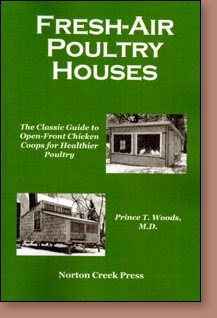 Prince provides a plethora of photos of open-air poultry houses and diagrams of how to build them. His missive convinced me to add extra ventilation, even though I've been warned that chickens are sensitive to drafts. Raising chickens is a lot like raising children. There are many theories and practices, and ways to insure good health among children and chickens. I do recall that every fall when we closed the windows of the house for winter, my children would get sick from breathing inside air. They didn't get TB, like the savages, but they did catch respiratory infections. Prince would approve of the ventilation in my coop. 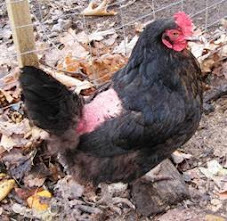 Are organic chickens less or more susceptible to drafts and colds?